Permit me, with all assumption, respectfully, to plead that, I have taken an oath to stand and speak before you as though you were a Commission of Inquiry in relation to the questioned conduct or misconduct of National Security Operatives who, on the 31st January 2019 were assigned by the National Security Council (NSC) to undertake an intelligence operation at a suspected warehouse allegedly housing some arms at La Bawaleshie, the precise area where an electoral polling station was stationed during the Ayawaso West Wuogon bye-election. This article, respectfully, shall not be directly evidenced in relation to the occurrences at La-Bawaleshi but would be somewhat related to the conduct of the national security operatives. I shall, therefore, draw points from a witnessed operation of same national security outfit but this time at a NUGS Congress held in the Methodist University College Ghana (MUCG), Dansoman Accra. Few months back, precisely from the 15th to 18th November 2018, I was a Press & Information Secretary Aspirant of the National Union of Ghana Students (NUGS). On the day of voting which was supposed to be the 18th day of November in the year noted above, the congress grounds, Methodist University College Ghana, Dansoman Accra was flooded with national security operatives, a little numbered less what was seen at La-Bawaleshie, the incident which triggered national tension and led to the constituting of an Emile Short Commission of Inquiry. As if the presence of the National Security Operatives, Police and Uniform Military Men should be an inspiration of peace, sanity, sanctity, protection and security, it was rather evil for the aforementioned to be present. Why? 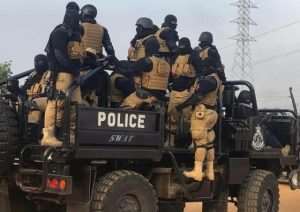 These security personnel especially the men from the National Security fermented and took part in causing fear and panic, insecurity and injustice, disrespecting the Ghanaian students who had travelled both far and near to elect their choice of leaders for the union as they were delegates. Simply put, the National Security Operatives present caused mayhem and ensured that same could not foster the smooth running of the electoral process. I would not like to bore your ears with stories of congress especially the abrupt end which however saw the NPP organize an imposing handing over ceremony to swear their chosen boys into office as NUGS executives, despite no delegate casting ballot at congress. This degradingly unacceptable practice by the New Patriotic Party (NPP), especially as a political party which boast of itself as the leading party in Ghana which upholds democratic principles was what incited myself and some other cheated aspirants to form our own faction of NUGS, an event which further broke the frontiers of the National Union of Ghana Students (NUGS) into three factions. Away from that, nonetheless, permit me respectfully to put to your attention that the character, act, display and gross insubordination of the security operatives at La-Bawaleshie is no different from what they displayed at this NUGS Congress I'm throwing light on. The uncoordinated display we have had to watch months ago as what transpired at La-Bawaleshie is not new to us who were eye witnesses to the events at MUCG during the NUGS Congress. In fact, I, Reindolf Amankwa, an aspirant of the congress was inhumanely intimidated by these operatives. At a point, a military man in military vesture, armed with an AK47, one whose identity I do not know told me he will slap me if I did not agree for the very faulty electoral system to operate. As if his word of mouth was not enough to intimidate me, he proceeded henceforward to carry out that which he had professed to do. At this time, the Security Coordinator who was present (name I do not know) rushed to hold him and later to advice him to desist from engaging in such an act, arguing that I had the right to protest the system as an aspirant. Even without knowing this Head of Security Team, permit me to use this medium to express my gratitude to him for his timely intervention that saved me from the heavy palms and shoulders of this military apparelled man. This seemingly dramatic incident is not hidden from the honest hearts, minds and tongues of colleague Ghanaian students who represented their respective Universities at the congress as delegates or observers. Permit me to mention some two names which were echoed by colleague students who knew some of these operatives. They are; "Double" and "Bamba". The former's name, I believe is not very new since Hon. Samuel Nartey George (Sam George) had mentioned time without number before the Emile Short Commission. For the purposes of helping them whose memories have faded, 'Double' is the National Security Operative who mentioned before the Commission that he was a Phone dealer at Circle-Accra. As far as my memory serves me, that same operative was present at our congress and took part in the highly unprofessional conduct I'm relating same to at La-Bawaleshie. All what I'm driving at is that, this unprofessional conduct of a mystery which we are trying to unfold lays bare at the nostrils of Colonel Michael Opoku. Of course he knows that the display by his boys at Ayawaso West Wuogon bye-election is not anything new since that was not the first time they had put up such an appalling act. I may not be able to say everything in this letter as I may want to put it. However, I shall not lose sight of the exact things I want to lay before the Ghanaian people. 1. The contradictory and parallel testimonies given by the National Security apparatus before the Wuogon Commission is only a sign of the insecurity citizens of Ghana have found themselves in. Though citizens have been made to believe that we have all the necessary security apparatus as a nation including personnel, these personnel are themselves our reason to feel unsecured. As in other countries, especially the Western World where security operatives see their citizens as the real employers therefore giving them the due honor and respect as I've had to believe by watching movies, Ghana is totally different. NUGS Congress at MUCG, periodic clashes between security forces and civilians, clashes between military and police, Ayawaso bye election are enough prove. 2. The undesired shooting, notwithstanding how many rounds of ammunitions were fired is a sign of the dark days we are gradually sprinting into. Though there was no shooting at the NUGS Congress, the use of "Shockers" to chase students helter skelter in the middle of the sleep night, at about 1am when election was still on hold was not far from the eyes of the delegates. You could hear students screaming uncontrollably yet who was kindhearted as an Operative to feel as we felt? None, not one. 3. The inhumane physical assault meted on the people as we have had to watch is yet another sign that 2020, if not carefully tamed shall be same in exhibition, possibly even bloody than seen at La-Bawaleshie. You may be surprised to know that some delegates received some physical assault at our congress meted on them by these security operatives. It is quite unfortunate I do not remember that particular student who was slapped by the operative. Eugene Kwakye, a student of Central University was shamelessly handcuffed for no crime committed. The only difference is that, at our congress, the physical abuse was in the form of slaps meted to some delegates who the operatives saw as being stubborn just as happened to Hon. Sam George. 4. Again, just as the Police Officers stationed at La-Bawaleshie could do less or nothing at all to salvage the situation, so were the Police Officers present at our NUGS Congress useless and able to do nothing to salvage the situation. It could be evidentially seen that the Policemen present at the NUGS Congress grounds were more afraid of the heavily built national security and armed military men than we the students probably were. Honestly, my physical gestures if I remember rightly were not very different from that which we saw Hon. Sam George exhibit. Anyway, I did not make any attempt to engage any security operative as in an argument except my disagreement to allow the electioneering process to be carried on without solving the anomalies which we had spotted. 5. You would have realised by now how all the leaders or officers (ie. Ministers of State National Security, Officers of the National Security) seem too lackadaisical, even after weeks of the happenings at La-Bawaleshie to make findings in the outcome of the supposed operation that was organized on certain intelligence gathered. That's same with the aftermath of the operation at our NUGS Congress. Days, weeks, months after our aborted congress, the Director of Operations had still not received any official report from the leader of operations, the man mentioned as "Double". What I'm trying to put across is that, if Colonel Michael Opoku or Hon. Bryan Acheampong or Hon. Albert Kan Dapaah, or DSP Azugu told the commission that any of them is yet to have an official report to know what business really took place, especially relating to the quest to know 'How many rounds of ammunitions were fired by the national security operatives?' they haven't lied. That seem to me as though it is a normal practice at the national security. If that's right, then, our national security system is out of feedback and the lack of feedback concerning the La-Bawaleshie incident is not new at all. This alone should sound an alarm into the ears of Ghanaians of the looming danger we are joyously heading towards. But wait! How on earth could anyone have expected an official report to be written and delivered to the Director of Operations or any of the Ministers in charge of Security when their most trusted leader, Double can neither speak nor write good English. Our National Security, with much respect has lost an amount of credence. Security intelligence has been sold to the highest bidder, the NPP. 6. You may have to know that the behavior and failure to help bring an amicable solution to some misunderstandings at the electoral grounds involving the EC and some aspirants including my self resulted in one of the Presidential candidates allegedly tendering in his withdrawal from the NUGS Presidential race. Fast forward to the Ayawaso West Wuogon Bye Election, one would appreciate how the NDC had to also pull out of the bye election following the conviction of the aforementioned political party that the electoral process had been tempered with because their polling agents, followers including their candidate were unsafe. I may not try to liken the happenings at Ayawaso West Wuogon to our NUGS Congress but one would also appreciate (which I believe) that the practicality we see could be linked as "brothers if not twins". I've taken some time to write these few lines just in order that Ghanaians may come to appreciate how serious the unprofessional misconduct of our national security operatives have become to the extent of marring even students' unions congresses. As I end, I would like to also bring to your attention a presumed attitude of Police Officers at Central University during PUSAG congress which halted and postponed the said congress to an Emergency. I plead with us to critically reexamine the activities of the National Security Commission for the fact of unearthing more anomalies at the Secretariat and for once, putting things right. The case should be established that members of vigilante groups should not be giving room in the NSC as we see "Bamba Boys" leader 'Bamba' now being an Operative. Members of the NDC have had reason to rant with regard the masked men because they know and did same by recruiting their vigilante boys into the same unit whilst they were in power. Both the NPP and NDC are therefore pelting another with pebbles without recognizing how evil their actions are to the peace, harmony and solidarity we share as one nation and one people with one destiny. But, to a furthest extent, the National Security apparatus seem to be a Mafia Establishment which is handled by the government in power to topple the Rights of some citizens and to also make useless and hopeless, the legitimacy of electoral processes especially one that is likely to go against certain human parties. Lest I forget to mention as I finally put my pen to rest that, "Ghana Is An Animal Farm". A farm where all the animals are equal but some are more equal than others. To pretend, the above statement is nonfactual is like pretending that no one will be offended by this article.